George Donald Sturman passed away peacefully at the age of 87 surrounded by his family in Santa Barbara, California on Sunday, January 17, 2016. George was born on July 28, 1928 in Detroit, Michigan, the middle child of Henry and Elizabeth Sturman. Henry moved the family to West Hartford, Connecticut, and later, pursuing a long-cherished dream, to a farm upstate. 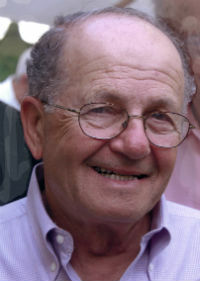 George remained in West Hartford for schooling and graduated from Hall High School, class of 1946. He then attended the University of Michigan, where he earned his undergraduate degree in 1950 and met his wife, Adrianne Reevman. He did graduate studies at the University of Illinois Dental School, class of 1954, served in the U.S. Army for two years at Fort Devens, MA, and did postgraduate research at Yale University. He then returned to the University of Illinois, where he completed his specialty in orthodontia. Moving back to the Hartford area with his young family in 1959, George joined his father’s orthodontic practice. For more than 45 years, George served the Greater Hartford area and West Hartford as an orthodontist, in solo and group practice, until retiring in 2005. He was a member and contributor of the Angle Society, an orthodontic organization, and for many years taught at the University of Connecticut as a member of the cleft palate team. George and Adrianne established deep roots in West Hartford, raising their family and developing lifelong friendships. Deeply curious about the world, they traveled frequently and extensively. George’s other great passions were golf, bridge, and oration, the last exhibited mostly at family affairs with considerable panache. In 2007 George and Adrianne moved to Santa Barbara, California to be closer to their granddaughters and live in a Mediterranean climate. There, he worked on perfecting his bridge game, investigated and wrote his family’s genealogy, and religiously followed the University of Michigan Wolverines in football and basketball and the UConn Huskies women’s basketball team. In Santa Barbara, George and Adrianne quickly built a new network of close friends, which included a dinner club George aptly coined “The Fed-Ups”. George is survived by Adrianne, his loving wife of 63 years; children Sally and Peter, daughter-in-law Hui-shu, granddaughters Leanne and Olivia, and siblings Martin and Sandy. He will be remembered for his compassion, friendship, generosity and wit, as well as all the smiles he perfected (human and canine alike) throughout his long and successful orthodontic career. He will be greatly missed. George was deeply interested in understanding his family history and Jewish heritage. For this reason, the family requests that in lieu of flowers, donations be made to Birthright Israel, www.birthrightisrael.com, or a charity of choice.